A tasty sweet and sour fish fillet for those who like to eat fish without those tiny fish bones. There are many kinds of fish fillet you can use if you can’t find labahita (surgeon fish) or lapu-lapu (grouper). Substitutes can be cream dory fillet or tilapia fillet since those fishes have white and tasty flesh. This dish is also very easy to cook. You only have to coat the fish fillet with eggs and bread crumbs before frying and just cooking the sauce with very few ingredients then combine them, the fish and the sauce, then serve hot. To make the sweet and sour sauce, in a saucepan, mix thoroughly the cornstarch and sugar in water. Add in onion, garlic, cucumber(optional), tomato(optional), pineapple juice, vinegar, soy sauce, and margarine. Cook over medium heat stirring constantly until the mixture starts to boil. Cook for about 2 minutes more until the sauce thickens then pour over fried fish fillets. 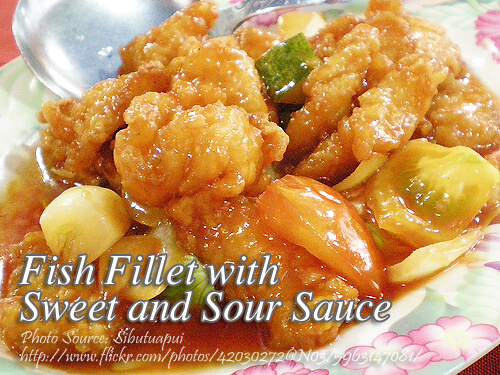 A tasty sweet and sour fish fillet for those who like to eat fish without those tiny fish bones. Clean the fish and remove the skin. Separate the flesh from the fish bones and cut the fillet into 1 inch crosswise. Rub the fillet with calamansi juice, salt, pepper and MSG. Before frying, dip in beaten eggs and roll in bread crumbs. Deep fry in a medium heat until golden brown. Set aside. To make the sauce, in a saucepan mix thoroughly the cornstarch and sugar in ¼ cup water. Add in onion, garlic, cucumber(optional), tomato(optional), pineapple juice, vinegar, soy sauce, and margarine. Cook over medium heat stirring constantly until the mixture starts to boil. Cook for about 2 minutes more until the sauce thickens then pour over fried fish fillets. Thanks Katherine for your rating and comment. Yes the fish fillet is good and you must try it also. Hi Jong, Thanks for the kind words! 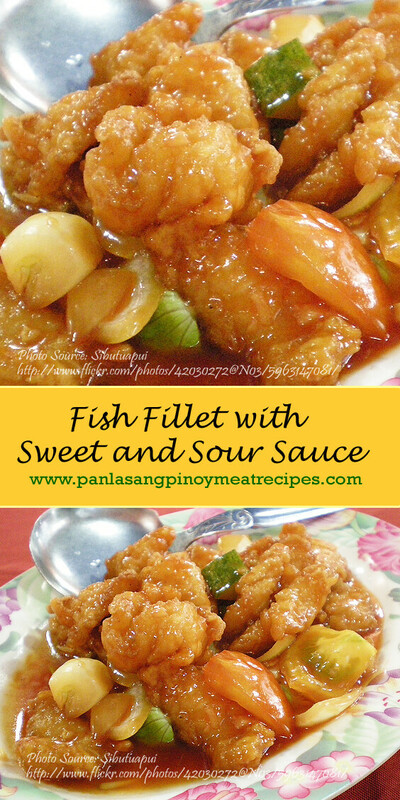 thank you for the simple and delicious Sweet and sour fish fillet recipe! Hi Corazon, you are very welcome! Thanks you for the Delicious recipe!! Now i will have my project!!thanks!! Hi Eaunice, you are very welcome! can i use another fish instead? like cream dory? Yes you can use cream dory.